I was nine years old when my Dad was called up to be a Chaplain in the Canadian Army during World War II. Before that he was a circuit preacher on the Canadian Prairies, and he had been in the army reserve. But when the War was raging and all the available men had to go overseas, he went too. Almost everyone at school those days had a dad, grandpa, uncle or older brother off in the war, and quite often the word would go around that someone’s relative was killed or missing in action. Everything was rationed during the war years. I remember going to the store with ration coupons for dairy products. But my younger sister and I didn’t suffer or want for anything. We had our Mom and our grandparents, and every holiday season the relatives came to Grandpa’s house for get-togethers. There was a lot of love in our house, making up for the absence of my father. When the War finally ended, the first newsreels were released about the horrible atrocities of the Nazi death camps. I was deeply touched by the films of the war and I’ve never forgotten those images of the Holocaust victims. My Dad had sent many letters and gifts from overseas. We received books from England, Dutch dolls and wooden shoes from Holland. And when Dad finally returned home, he brought an antique German clock which had been wrapped up in an enormous Nazi flag and hidden at the place in Antwerp, Holland, where the armistice was signed. Dad said the soldiers of his hospital unit had brought it to him. Inside the clock was a treasure-trove of antique jewellery, which he gave my mother. The clock was hung on the wall. The Nazi flag was wrapped up and packed away in Dad’s war box along with his photos of bombed buildings and army camps and letters from the families of the dead and wounded soldiers he had tended while he was the army hospital chaplain. The year after my Dad returned from the war, our family moved to the West Coast of Canada where he would be pastor of a Baptist church. That Christmas was our first Christmas together in a new home. At the church where Dad was the new pastor, there was to be a Christmas concert. My parents enjoyed organizing concerts and pageants. Mom was a clever seamstress and loved making costumes, and Dad always made sure the Church was beautifully decorated with pine and cedar boughs and lots of Christmas candles. There would be a creche and a candlelight processional in the church Christmas Sunday and a pageant with shepherds, Wise men, angels and the Holy Family. We used the life-like little doll named Peter that Dad had sent my sister from Belgium for the Baby Jesus in the creche. At the Sunday school concert, Dad would perform his amusing rendition of “When Father Papered the Parlour” and there would be a visit from Santa Claus for the little ones. But there was one big problem. Nobody had a Santa Claus suit. So Dad unpacked his box of war souvenirs and got out the big Nazi flag, the flag that symbolized everything evil. Mom remarked how lovely and thick the red wool fabric was. And there was so much of it! “What a splendid idea,” Dad agreed. Mom went to work designing, cutting and sewing and by the night of the Christmas concert, she had created a perfect Santa Claus suit out of the flag. Even though the war was over, and the bad things the Nazis had done would always be remembered, the flag had been put to good use. The red woollen Santa suit made out of a Nazi flag made that Christmas extra special. In fact, the Sunday school Santa at the Grandview Baptist Church’s Christmas concert wore that Santa suit for many years afterwards. We always played games at our house on Christmas eve and at other times during the holidays when the family gathered. I have warm memories of us sitting around a crokinole board, flicking the round wooden discs with a forefinger as I attempted to get it into the winning zone or, better still, into the center hole. Those big wooden hexagonal-shaped boards were as much a part of Christmas as the tree and presents. We also played Chinese checkers and Snakes and Ladders. Having an aversion to snakes, it troubled me to sit in front of that board and have to slide my game chip down their slithery backs. I’d much rather climb the ladders. Some years later we advanced to some new games: Monopoly, where you played with pretend money and bought and sold property; and Clue, a detective game where you got to solve a murder. (Always the wanna-be-crime writer, I loved that game!). Later it was Scrabble that was a popular game and one I still enjoy. One year, when I was married and my husband was doing work for a businessman in Chinatown, we were invited to join the family for the Chinese New Years. The place where they lived and where Jimmy Lee, the owner had his watch-repair shop, happened to be listed in the Guinness Book as the narrowest occupied building in the world. And it was narrow. I remember being amazed when we were invited into the Lee’s living room and it was barely wide enough for a couch. Then I had a great surprise when we went ‘downstairs’ where the party was to be held, and discovered that the rec room was right under Pender Street. Who would ever guess? I wondered if it was at one time one of the secret rooms that led into the mysterious Chinatown underground. 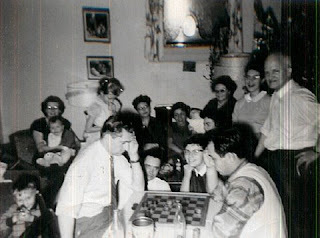 There were a number of tables set up in Jimmy’s ‘rec room’ and on each was a board with coloured tiles and a bottle of very expensive whiskey. The players sat around on the four sides of each table and one shuffled through the tiles. This was mah-jong. I was fascinated! The sound of the tiles clicking was a familiar one but until that moment I didn’t realize that when I walked through Chinatown and heard the sound it was a mah-jong game being played in some back room. It’s one of the popular Chinese gambling games and they always play it on their new years eve. A lot of money went back and forth on those tables and many bottles of expensive whiskey were consumed. I watched in rapt silence as the players gambled, won or lost. I wished I knew how to play and for a long time afterwards wanted to buy a mah-jong board and get someone to teach me. But gambling had never been allowed in my home. Not even a game of gin rummy. Eventually, I learned how to play poker and on some Christmases my husband and I would invite friends over for friendly games of Rummoli, with a deck of cards, a stack of poker chips. The stakes weren’t too high as we always played for pennies. No bottles of expensive whiskey either, just cases of beer and chips with dip for refreshments. I’ve never forgotten those Christmas eves of playing games with the family and every time I go by a toy store where they sell games, I think of buying a monopoly game or a scrabble game to play. Instead when I have the family over for Christmas Eve dinner we get into playing “Spot the hand!” scoring point whenever the hand in the video version of the fireplace comes out to place a new log on the TV fire. But now I have a gas fireplace and even that game has ended. Must find a new form of entertainment for this year: Video Games anyone? HEY, MISS TAMBOURINE GIRL PLAY THAT SONG FOR ME! Before she married Dad, my mother was a nurse in a Salvation Army hospital. She played the tambourine in the Salvation Army band. Perhaps that’s what inspired her that Christmas when I was four years old, to teach me to play the tambourine. We were living in Lloyminster Saskachewan where my Dad was the pastor of a Baptist church. Because it was then a small railroad community, all the local churches went together at Christmas to produce a Christmas concert. That year, Mom decided she would dress me up in her Salvation Army bonnet and show me how to play the tambourine. She also taught me a verse to recite for the concert. It was to be my debut on stage. I don’t remember my exact role in this Christmas pageant, or what other children would perform. I do remember, very clearly, being coaxed onto a stage in front of what seemed like an audience of hundreds of strangers (probably just twenty or thirty.) I was absolutely terrified. I stood there, dressed in mom’s oversized S.A. bonnet, my hair coiled in Shirley Temple ringlets (a procedure done the night before by Mom, each hank of hair wrapped carefully in rags). I was probably wearing one of the lovely hand-smocked dresses Mom made me, and those horrid brown ribbed tights (because it was a freezing Prairie winter day). I was carrying a large, jangling tambourine - the same tambourine Mom used to play with the S.A. band. As I stepped (or was gently pushed) onto the stage, I heard a long, audible gasp from the audience. Bewildered, I stared down at that vast sea of faces, frozen with stage fright. Someone from the wings prompted me, or possibly it was Mom herself coaxing me to perform. To this day I remember those exact words and how I felt at that moment. Mortified and scared stiff! I could have died on the spot of embarrassment. Instantly I burst into tears and ran off the stage into my Mom’s arms. Segue ahead four years. I’m eight years old and it’s Christmas Concert time at school. By now we are living in Brantford, Ontario. I suppose because of my ‘experience’ I am chosen to play the tambourine in the class rhythm band for the Christmas concert. We are dressed in red pill-box hats and capes and paraded onto the stage. In the photograph taken of this performance, I am crowded, tiny and shy, in behind the bigger kids. I am not smiling. I probably had stage fright. I do not look happy to be playing the tambourine. Possibly I had hoped to be a drummer or triangle player. Why then, did my career as tambourine player follow me all the way into my adult life? Segue again, many years into the future, the 1970’s. I am living in a communal house with my kids and a renegade band of hippies. There is always music in our house. My son, age 14, has become an ardent guitarist. There are always musical instruments at our communal gatherings, including a tambourine. Inspired by the beat of the music, one day I picked the tambourine up and began to tap and shake it to the rhythm of the rock beat. The tambourine player in me was resurrected. From then on, I practiced and always played the tambourine at parties. Eventually, one Saturday afternoon at the jam session at the American Hotel, I got brave enough to get on stage with the band and play. I was good, so good in fact there was one particular drummer who would always request me to accompany him. By now, my son was an accomplished Blues musician. He said he was going to play at the American Hotel jam session. “I play the tambourine there on Saturdays,” I announced. He looked at me aghast. “You mean you get up on the stage and play the tambourine? “But you’re my Mom!” he sputtered. 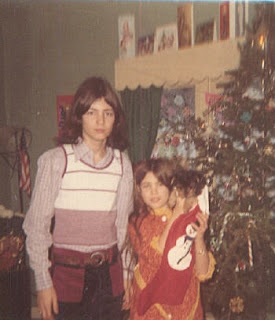 the tambourine in the first place, at that Christmas concert so long ago. My boyfriend was on the lam from the American army as this was during the Viet Nam war so any work he had was under-the-table at a car wash. The other lodgers were young college students, and an occasional deserter or wayward hippie that took shelter with us. It happened that I had a lot of material goods brought from my past life, so I sorted through the china tea-cups, jewellery and other items that I had stored away, carefully picking just the right gift for each of my friends. The girls in the house baked Christmas goodies and the old house was full of the delicious, familiar smells of the holidays. The whole motley crew enjoyed a turkey dinner with all the trimmings. It was a special Christmas because it wasn’t in the least bit ‘commercial’. Everything we had made or chosen from our own belongings to give away. It gave Christmas a new, special meaning. 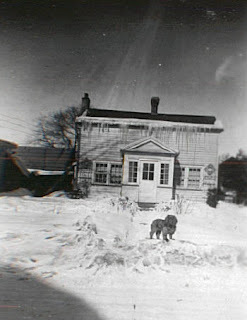 Grandpa's House in Stratford Ontario. That's our dog Dutchess out in front. tongue flickering, like a real fire-breathing dragon.